Serapis was an anthropomorphic god created by the Greek pharaoh Ptolemy I. Ptolemy I chose Serapis to be the official god of Egypt and Greece. He hoped a common religious base would unify the two peoples and ease tension in the country. Serapis' attributes were both Egyptian and Hellenistic. Serapis became very popular and his cult quickly spread from its center in Alexandria. A Roman historian insisted that the god was originally from Asia Minor. However, Egypt probably provided the essential attributes of Serapis. Serapis' Egyptian nature can be seen in his roots, which were drawn from the cults of Osiris and the Apis bull. These cults had been combined prior to the reign of Ptolemy I. At that time, a sacred bull of Memphis called Osorapis was worshipped after its death. Osorapis was an agricultural god whose cult emphasized the Egyptian principles of life after death. The early Greek pharaohs seemed to have been drawn to Osorapis as a god who seemed to fuse the myriad of Egyptian deities and possessed aspects that were easily fusible with the gods of the Greeks. The Hellenistic elements of Serapis dominate Serapis' "personality" and iconogrpahy. Many greek gods contributed to his nature, including: Zeus, Helios, Dionysos, Hades and Aesculapius. From Zeus and Helios he received the aspects of sovereignty and sun-god. Dionysos brought to him the attribute of presiding over nature. Hades linked him to the afterlife and Aesculapius gave him the art of healing. 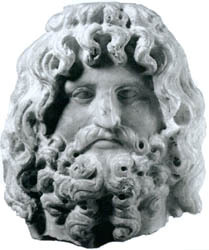 The Greek images of Serapis show him with long hair and a long beard. He is seated on a throne with the three-headed dog of Hades, Cerberus, at his feet. The Egyptian images of the god show him as a mummified human with the bead of a bull. He is crowned with the crescent moon and two plumes.